אסור להתענות במוצאי חג השבועות: - It is forbidden to fast on the Motzai Shavuos. Usually the term ---מוצאי Motzai--- refers to the night following, as in Motzai Shabbos or Motzai Yom-Tov, which means the night folowing the day of Shabbos or Yom-tov. Anyone who establishes an addition [issur] to the Festival on the day after the Festival by eating and drinking, ... This is going according to the second explanation of Raashi (ibid) that Issur L'chag is referring to the day after the Festival. 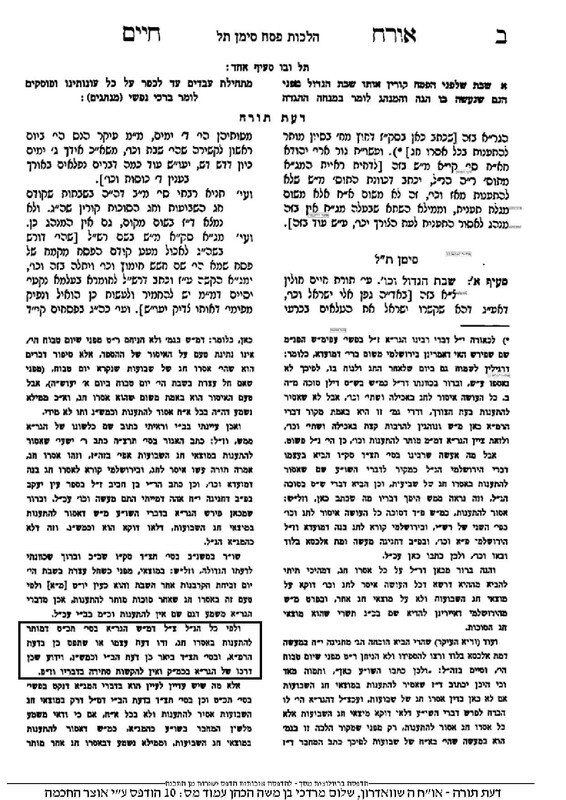 The Gra then explains that because a certain story brought in the gemara in Chagiga (which is relevant to this subject) happened to take place on Isru chag of Shavuos, therefore this halacha, of not fasting on Isru-Chag, is brought in hilchos shavuos, although it pertains to any Yom-Tov as does the Gemara in Sukkah. It is customary to somewhat add in eating and drinking on the day after holidays, And this is [called] Isru-chag. אבל מותר להתענות - But one is permitted to fast. - (And he proves it from a gemara in Taanis and in Chagiga). This seems to say that it is customary to eat on Isru-chag but not mandatory. This seems to contradict the Gra cited above which says that the halacha brought in the shulchan aruch that It is forbidden to fast on the Motzai Shavuos, is not specific to Shavuos, but pertains also to all holidays, and fasting on Isru-chag of any Yom Tov is forbidden. Rav Sholom Shvadron, in the footnotes to his grandfather's sefer דעת תורה סוף סי' תכ"ט, points out this contradiction. He answers, that in תכ"ט the Gr"a is writing the opinion of the רמ"א, or his own opinion, and in תצ"ד he is just explaining the opinion of the Beis Yosef. As this is his practice throughout his notes. Not the answer you're looking for? Browse other questions tagged halacha yom-tov isru-chag . Who should observe Isru Chag? Do sefirah mourning restrictions occur on Isru Chag? Why is the day after yom tov referred to as isru chag? Av HaRachamim on Shabbat Isru Chag Pesach in Israel?